Anna is a cute pink-haired classmate of Mikan. She has the Alice of Cooking and makes up various dishes for her friends. She can make some of her dishes come to life. She is member of the "3 geeky sisters." She is usually seen with Nonoko and she also has a crush on Misaki-sensei. She looks up to her senior named Miruku who the same Alice as hers. 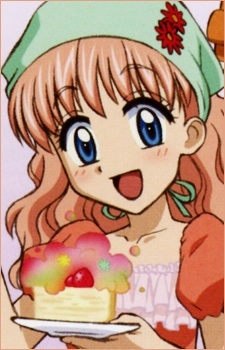 She also learned how to make Special Chocolates from Miruku in the Radio Drama. There was a time her Alice got switched with Nonoko in the Radio Drama. She also belongs in the Technical Class. She is also a Single Star like Nonoko and Mikan.